Liz "Queenie" Windsor in 2006. She has been, at one point or another, the ruler of 40 independent nations, all of which were at one point in time British colonies or possessions (except, of course, for the UK itself). When she first ascended to the throne in 1952, there was some confusion as to her royal title, since Elizabeth I had ruled England, what is now Northern Ireland and Wales in the 16th century, prior to the Union of Crowns, while there had never been a Queen Elizabeth of Scotland. [note 2] There were even a few bewildering lawsuits from angry Scottish people, and bomb threats against various bodies. The compromise they came up with was that for future monarchs, they would use whichever regnal number is higher for England or Scotland (which they'd been unintentionally doing all along). This is why postboxes in Scotland bear only a crown and not the "E II R" insignia seen elsewhere in the UK. Not a lot of people (outside of Scotland, obviously) know that. Interestingly, she was the one who insisted upon televising her own coronation, and has happily embraced new technologies[note 3] and shown appreciable support for science. She served in World War II as a mechanic and an ambulance driver, which may partly explain her interest in technology. She is also known to be a somewhat avid fan of the BBC science fiction series Doctor Who. In fact, the only BBC director general to not be knighted during Elizabeth II's tenure as monarch is the one responsible for the show's cancellation in the late 1980s (actually this was true for a long time but lately there's been a series of BBC scandals from the Hutton Inquiry to Jimmy Savile , and DGs have been falling like flies). 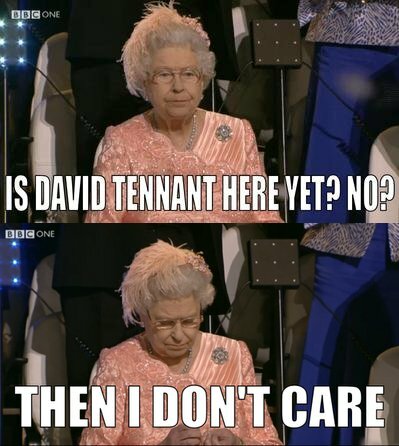 There is some suspicion that this may partly explain her apparent boredom during the opening ceremonies of the London 2012 Olympics (one episode of Doctor Who had the titular Doctor light the cauldron for the 2012 Olympics). She is also somewhat known for having a rather "wicked" sense of humor humour, which was shown quite amusingly by the way her entry into the stadium was portrayed (with the help of a stunt-double) at the aforementioned Olympic Games' opening ceremonies as seen here. This may have more to do with the nature of British humour and wit in general than with the Queen's wit in particular, however. Since 1993 she has been a full-fledged UK taxpayer. So she basically pays herself 63 pence per year to host parties and wave, which is a nice job if you can get it. Paradise Papers — Why was the Queen hiding money offshore? ↑ Though her great-great-grandmother Vicky actually styled herself Lady of Mann. Yes, two Ns. ↑ Because Scotland never had to put up with the murderous Tudors. Only the murderous Stewarts/Stuarts. ↑ There was a dumb manufactroversy when Barack Obama gave her an iPod as a gift during their first meeting; although it is true she already had an iPod, she actually had requested the one Obama gave her herself, as her existing one was out of date. ↑ Who, up until the appearance of Edward Cullen, seemed to be the no.1 fancy piece for tweenage girls everywhere. ↑ This guy's been on it too. ↑ See the Wikipedia article on MacCormick v Lord Advocate. This page was last modified on 23 February 2019, at 18:06.